Whenever outside air is warmer than inside air, a condensation problem is likely to appear in your basement. Basements are below ground and therefore, most of the time, fairly cool. When moist and hot air (like that found on a summer day) are combined with cool basement conditions, condensation forms on cool surfaces such as ductwork, glass and concrete foundations. Why does this occur? Keep in mind that the relative humidity of air goes up 2.2% for every one degree it is cooled. Consider, for example, an 80-degree day with relative humidity level of 80%. As the warm and moist outside air is drawn into your basement to be cooled to a comfortable 68 degrees, the basement's relative humidity is raised another 26.4% (12 degrees x 2.2%). Add that to the pre-existing 80% humidity level and you've got a number greater than 100%. This is really saturated air – so the air gives up its saturation or excess moisture by "depositing" it on cold surfaces such as basement walls, floors, exposed ductwork, water tanks and pipes. The entire process is called condensation. To best eliminate condensation in a basement, the humidity in the air needs to be reduced or "dehumidified." This should be done consistently and effectively to best balance air temperature, humidity levels and the natural "updraft" of air flow from the bottom levels of a home up and out the upper levels (think attic and roof vents). For energy-efficient dehumidification and air filtration, consider the SaniDry™ Basement Air System for your basement. This unit can be ducted to other rooms and provides dual-stage filtration for the capture of indoor allergens as small as two microns. With the ability to pull up to 100 pints per day of moisture from the air on just 6.8 amps of energy, the SaniDry™ Basement Air System has earned the EnergyStar seal of approval. Yes, the SaniDry™ Basement Air System is portable and can be moved easily. Just remember, when selecting a position for the SaniDry™ in your new home be sure to place it near a floor drain for consistent, unrestricted drainage from the unit. This substance is called efflorescence. It consists of deposits from the minerals in the concrete, mortar, or soils that remain behind when water evaporates from the surface of the wall or floor. It appears as a white powder or crystals. It is sometimes confused with mold, but it is not alive – just mineral residue. It is not harmful and can be swept or brushed off. It is a sign that water is (slowly) coming through the wall or floor. Water and moisture enter a building's foundation through a number of different ways. The most common is at the point where the basement wall and basement floor meet (cold joint). This, simply put, is a natural seam where water can easily penetrate your foundation. Another source of moisture intrusion is via hydrostatic pressure at mortar joints or through porous block. This "built up" pressure (earth surrounding a foundation laden with excessive moisture) causes water to penetrate cracks and joints. 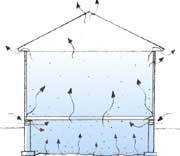 There are other ways water can enter a foundation, though not as easily noticeable. The expert waterproofing representatives at Omni Basement Systems are trained to determine the exact source of moisture intrusion and design the most effective solution for each unique basement and situation. Once you've determined the source of water in your basement, it is imperative to correct the problem so water never enters your living area again! Wet basements are a problem in new and old homes alike. Reputable builders waterproof new construction. The problem with most new construction waterproofing, however, is that it is one of the first jobs completed by the builder. Typically this "waterproofing" consists of a spray-on exterior damp proofing and the installation of a perimeter drain tile system. Once these installations are complete, literally dozens of the contractors involved in building a new home go to work on top of, around and make holes in the foundation for electrical conduit, gas lines, other utilities and ultimately, jeopardize the system's performance. Because of this, even new homes can experience water intrusion problems. Omni Basement Systems can help. Our waterproofing systems are designed to meet the specific needs of each property. Every situation is evaluated carefully and the homeowner is involved in designing the system that meets their needs. Our systems can be installed in less than a day and require no penetrations to your foundation and no excavation around the perimeter of your home. For professional waterproofing offering a 25 year transferable warranty, be sure to contact Omni Basement Systems Our expert waterproofing specialists can assist you in designing a system that ensures your basement will be dry. I want to finish my basement, is there a way to guarantee a dry basement? For the majority of homeowners, especially those considering renovating or finishing their basement level, either a sump pump or drain tile system, or the combination of the two, just isn't good enough. Protect your investment with our patented products and award winning service before you remodel your basement. Look to expert professionals at Omni Basement Systems for systems that get the job done quickly and cost effectively. Contact us today for a FREE, no-obligation inspection and estimate. Finishing your basement can increase the living space and value of your home. If you are going to finish your basement, we recommend taking several precautions to protect your finishing investment. If you have already finished your basement, the majority of these precautions can still be made. For more information on each of these preparations, please contact us today. Repairs depend largely on the nature of the foundation problem. For instance, a typical bowing basement wall can be stabilized in less than a day (situations vary) with little disruption to a lawn, landscaping or decks. For settlement repairs, Omni Basement Systems conducts minimal excavation on the exterior of a property to expose the foundation's footings and the soil is replaced once work is complete. With every project, before work begins, Omni Basement Systems fully explains our process and the level of disturbance to be expected. For more information, fill out our online contact form or call our toll free number and one of the Omni Basement Systems representatives can visit with you to explain in greater detail. What is a wall anchor and how is it installed? Wall anchors restore the structural integrity of walls without having to rebuild them. Technicians install the Wall Anchor System by inserting a steel anchor rod through the wall into the outside earth. A steel anchor is then attached to the rod through a vertical hole in the ground. Finally, a steel wall plate secures the rod to the inside basement wall. Anchors can be placed in different locations along the wall and rod extenders can be used to avoid decks, flower beds, and other landscaping. The entire process usually takes less than one day and since we do not rebuild the entire wall, your home and lawn are left in almost the same condition as when the technicians arrive. 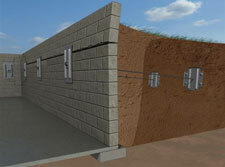 The Wall Anchor System is a property owner's alternative to completely removing and rebuilding basement walls that have become cracked and bowed as a result of lateral earth pressures exceeding the allowable design capacity of the wall. The U.S. Department of Housing and Urban Development (HUD) has recognized wall anchors as a viable option for stabilizing basement/foundation walls. With the Wall Anchor System, Omni Basement Systems provides a 25 year transferable warranty that the wall anchors will stop additional inward horizontal movement of the repaired wall(s). In many cases, with proper tension, the anchors can move walls back to their original position. In situations involving walls with extreme bowing, excavation may be required to safely and efficiently straighten the wall. Most systems offered by Omni Basement Systems come with a fully transferable 25 year warranty. Warranty information is provided with all written estimates. If you have specific questions about the warranty, feel free to call the Omni Basement Systems' toll free number. Once upon a time, certain building codes required vents be placed in crawl spaces beneath homes during the construction phase. Since that time, building officials have realized these requirements are incorrect since vents allow hot and humid summer air to flow into crawlspaces promoting condensation, wood rot and mold growth. In winter months, open vents allow cold air to enter crawlspaces and flow unrestricted into upper levels increasing heat loss and lowering energy efficiency. Thankfully, building codes are changing. In the near future a vented dirt crawl space will be a thing of the past. Keep in mind, sealing crawlspace vents is just one of two necessary steps toward improving energy efficiency and indoor air quality. The other vital step involves encapsulating a crawl space – separating your home from moisture-laden soils below. Omni Basement Systems offers both the CleanSpace® Encapsulation System and crawl space vent/crawl space door covers for a complete and permanent solution. 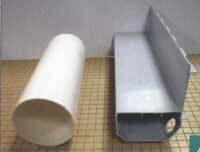 A vented crawl space wastes an enormous amount of energy. Since a home "breathes" (drawing air from lower levels and expelling air via upper levels), outside air is flowing constantly throughout a home that has a vented crawlspace beneath it. This outside air, which the home has "sucked" from the crawlspace cavity below, carries with it excess humidity from the moisture-laden soils of the crawlspace floor. This type of airflow increases the work "load" of a home's heating and cooling system since the air must be cooled, dehumidified and/or heated. This taxes even the most efficient heating and cooling system. By simply encapsulating a home's dirt crawlspace and closing all vents, a home can draw air from proper sources such as return air vents and exchangers instead of pulling from poor air quality cavities such as a dirt crawlspace. This is the equivalent of shutting open doors or windows and eliminating energy dollar loss. An independent study revealed that homeowners who properly fix their vented dirt crawl space can save 10% to 20% on their heating and air conditioning costs! In addition to home energy savings, a properly encapsulated and sealed crawlspace prevents eventual wood floor joist replacement due to rot, costly mold remediation and eventual property-value reduction.